Anthony Stansfeld, left, the police and crime commissioner for the Thames Valley, issued the warning after the Ministry of Justice announced it will close three courts in the area under his control. Mr Stansfeld, a Conservative, said local newspapers would not turn up to cases being heard “many miles away”, adding the MoJ had ignored its own consultation into the closures of courts at Aylesbury, Bicester and Newbury. 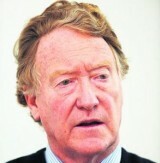 Mr Stansfeld said the proposal “flies in the face” of the Ministry’s pledge to put victims first. He added: “It will result in more failed cases as victims and witnesses will have to travel long distances to get to courts. It will waste a considerable amount of police time getting officers to courts. “It takes local justice away from the areas in which crimes are committed. Local justice will not be seen to be done as the local press will not turn up to cases heard in courts many miles away. The closure of the West Berkshire Court, in Newbury, would see reporters faced with a journey of almost 20 miles to cover cases in Reading. Weekly News group editor Andy Murrill said: “The decision to close West Berkshire Magistrates’ Court is very bad news indeed for open justice. There has been a courthouse in Newbury dating back to 1666 and, even, though it now only operates once a week, it functions well and does a good job in dispensing local justice. “Moving cases many miles away to various magistrates’ courts across Berkshire, and possibly Wiltshire, will cause huge inconvenience for victims, witnesses and police officers. Added Andy: “We remain determined to cover court as it is so important that justice is seen to be done and reported to the public. But this won’t be easy and will inevitably require sacrifices elsewhere in our news operation. “The very least they can now do know is arrange for cases from West Berkshire to be heard on the same day in the same court, whenever possible. “The decision to close West Berkshire Magistrates’ Court was opposed by our MP Richard Benyon, Thames Valley police and crime commissioner Anthony Stansfeld and local magistrates. A total of 86 courts and tribunal hearing centres will shut as part of the cuts – almost one fifth of such facilities in England and Wales. Is it such a loss? A lot of weekly papers are so poorly staffed that they do not bother to attend local courts regularly and often not at all. They rely on later press releases from police PROs, which are factually correct but unbalanced because they seldom contain one line of mitigation. (no criticism intended, that’s not their role). In fact we covered it week in, week out. Whilst this will make it more difficult for reporting, perhaps Mr Stansfeld would like to consider his posturing around the public knowing about crime in their area against how the organisation he does control, Thames Valley Police, operates. Its release of information to the public via the media has steadily decreased over many years. It is also a bit inconsistent to complain about the Court Service shutting down facilities to save money whilst overseeing another branch of the criminal justice system that is also shutting down buildings due to cost. Newspapers who close local offices complaining about others closing local premises. I have some cake – I may eat it as well.